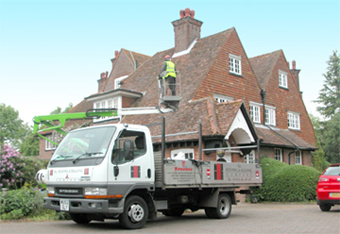 Our family run roofing business in High Wycombe was established back in 1985 concentrating mainly within the flat and pitch roof market. Since then, and with over 20 years experience behind us, our business has grown to offer customers a more extensive service for both domestic and industrial projects. We have strived to keep our professional yet friendly approach with all our customers and NEVER employ pushy salesmen. The principal differences these days are that we now offer more services and choices to help you complete your roofing or building requirements, whether they be garage roof renewal, flat roof replacement, EPDM roofing, asbestos removal or a flat roof replacement. There have been many changes within the flat roofing field over the past 10 years, predominantly the trend to have an EPDM Rubber Roof fitted in preference to the old style 3-layer bitumen roof. During our first 13 years we successfully installed hundreds of traditional 3-layer felt systems. Back in 1998 we became one of the first in Buckinghamshire to be authorised installers of Firestone EPDM single-ply ‘rubber’ roofing and while, like others, we were sceptical about the new technology working well in the flat roofing market, we can now totally appreciate the advantages this system can offer as it supersedes the outdated 3-layer hot bitumen flat roofing. It is easier to lay, has a longer lifespan and eliminates the use of the dangerous bitumen burning pot which in turn keeps our insurance premiums to a minimum, a saving we can pass on to you our customers. Since the year 2000 we have noticed a vast increase in the need to attend to asbestos roofs as they become outdated and begin to breakdown. Now, 50% of our business is dedicated to the replacement of asbestos roofs using Plastic Coated Steel Box Profile. Customers can be assured that we have full public liability insurance and a waste carrier’s licence in order to dispose of their old asbestos correctly and safely. We are still a family run roofing business today and appreciate, more than ever, how important it is to get the right person for the job. Our workforce is experienced in all their trades and skilled to the highest standards. We ensure every job is finished to give complete customer satisfaction. We have full public liability insurance and have many satisfied customers who include, among others the Ministry of Defence, Wycombe District Council and British Telecommunications. Should there be any service you require and cannot find within the contents of this web site, please let us know and we will be only too happy to recommend an alternative reputable company for your needs. let us offer you a free no obligation quotation."